Celebrate Recovery (CR) is a Christ-centered, 12 step recovery program for anyone struggling with a hurt, a pain or an addiction of any kind. Celebrate Recovery is a safe place to find community and freedom from the issues that are controlling your life. Jesus is the only way! No program or 12 step truly sets one free from pain, struggles or addictions. At Calvary, we believe that Jesus alone has paid the debt of our sin, set us free and make us a new person. Are you ready to be set free from your hurt, habit, or hangup? Are you ready to be made new? Join us this Wednesday at 6:00pm in the Calvary Ministry Center (Old Grocery Store). WHAT SHOULD I EXPECT AT CELEBRATE RECOVERY ON WEDNESDAYS @ 6:00pm? Is designed for the participant to set aside the busyness and stress of the outside world by entering into a time of prayer, praise and worship, and teaching as a way of getting in touch with the one and only Higher Power, Jesus Christ. During this time you will hear stories of hope from people who are now celebrating the recovery that they have found in Christ. You will also hear Biblical truth about what Jesus has done for us and how we can begin to trust in Him in the business of life. Meets immediately after the large group meeting and provides a place for the participant to connect with other Celebrate Recovery attendees. This is a safe place where participants can be in gender-specific groups. Just as the name suggests, this is a time where participants can share openly about anything (this is not manditory). 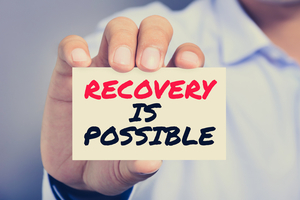 Plan to hang out afterwards and get to know others who are celebrating their recovery or are seeking hope as they seek recovery. Need Childcare? Calvary will have Activities for children of all ages. - NURSERY- Ages 0-4 in the Calvary children's building. - CALVARY KIDS- Children's Ministry for grades K-6th. - THE GARAGE YOUTH- Grades 7th-12th.